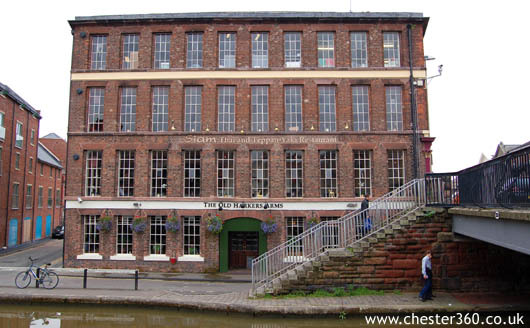 On the 1st floor of this converted warehouse on the Chester Canal is Chester’s first Japanese Teppanyaki Restaurant while upstairs is an authentic Thai Restaurant. At ground level, as you can see on the photo is the Old Harkers Arms Pub. Teppanyaki (鉄板焼き, teppan'yaki) is a type of Japanese cuisine that uses an iron griddle to cook food. The word "teppanyaki" is derived from teppan (鉄板), which means iron plate, and yaki (焼き), which means grilled. 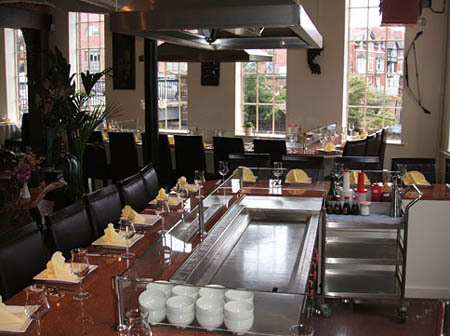 In Japan, teppanyaki may refer to any of a number of dishes cooked using a teppan, including okonomiyaki, yakisoba, and monjayaki, frequently with the hot plate located in the center of the diners' table.